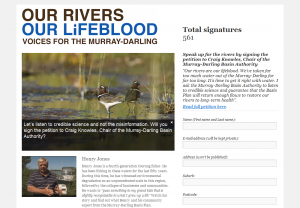 There is an opportunity to speak up for the rivers by signing the petition to Craig Knowles, Chair of the Murray-Darling Basin Authority. Legislation regarding the water-sharing arrangements between the states of the Murray-Darling Basin will be presented to Federal Parliament early in 2012 ( only 6 months away). The local Clayton based group Rivers, Lakes and Coorong (RLCAG) are one of the many groups nationally that are working tirelessly to protect our Murray Darling Basin and are urging everyone in the region to join the voice. To access the online petition just click on the link below – it’s really easy and it WILL make a difference.